In the last Library's book sale I bought a weird book called "Booze Cakes" . The title on its own grabbed my attention so I bought it (I can't resist sales!!!) just to discover later on that their ideas are great but some of the bake good recipes I can do better (sorry...to the book's authors) as I have baked most of the things they have recipes for. Been there done that kind of thing. 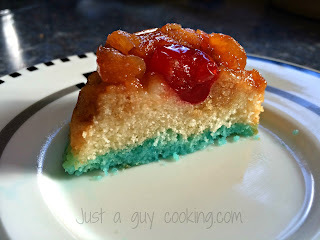 They have this Blue Hawaii Upside-down Pineapple Cupcake recipe and I loved the idea (who doesn't like cupcakes?...who doesn't like cocktails?...) so the combo sounds great to me. Based on my own upside-down pineapple cake recipe I bake, I decided to give it a try. I used my cupcake recipe and I used their idea of the cocktail combo plus plus... I did increased the Rum and Curacao amount by quite a bit and I did change the way to incorporate them into the recipe. The end result was absolutely fantastic. The cupcakes were (I know... "were" because the current wife ate them all but one) out of this world good. They are moist, aromatic and flavorful. They are NOT by far a kids treat but if you are having friends over -I never do because I have no friends- this can be the cherry in the cake after a good dinner. I can guarantee you that they will disappear! 2. Place the 65 g of room temperature butter in your electric mixer bowl and add 1/2 Cup of brown sugar. Mix well until soft but a bit crumby. Add the 4 tbsp of rum. 4. Grease your cupcake pan. Here you have 2 choices: you can use a “jumbo” cupcake pan or a medium size cupcake pan -that is what I used-, If you use the “jumbo” one, then you will have less cupcakes but of larger size and the pineapple will be whole. I like smaller bite size cupcakes, so I went for the smaller, regular cupcake pan. 5. Place about a teaspoon of the butter-brown sugar-rum mixture in each cupcake dish and press the mixture down. 6. Place a pineapple ring on top of every layer of butter-brown sugar-rum mixture if you are doing the jumbo cupcakes OR break in medium size pieces the pineapple rings and place them in each cupcake dish trying to recreate a ring (remember that the cherries will go in the center!). 8. In a large mixing bowl, add the 125g of the room temperature butter and the salt and add the sugar. Mix until soft and creamy, then add one egg and mix again until incorporated. Add the second egg until fully incorporated. 10. In a separate bowl, sift the flour and the baking powder and mix. 11. Now we are going to incorporate our dry ingredients to our buttery mix we have in the electric mixer bowl. Add 1/3 of the dry mix and incorporate well (about 2 minutes), then add the pineapple juice, then 1/3 of the flour mix and incorporate (about 2 minutes), add the milk and finally add the last bit of flour mix and incorporate. 12. NOTE! If your mix is too dry (happens often) then just add a bit of the pineapple juice and mix. We want a soft batter…not liquid but definitely not heavy and dry. 13. When the batter is ready, divide an equal portion of batter for each cupcake dish. I usually use a spoon full for this. 14. After dividing in equal parts the batter (you know…take a bit from this one and put it in that one kind of thing…), tap the pan to get rid of air bubbles. REMEMBER DO NOT OVERFILL!. 15. Place in the oven and bake at 350°F for 20-25mins. Watch the cupcakes. They are done when the tops are golden brown. They will be a bit -or a lot- overflowed than the actual mold. No worries…we can eat those separately. 16. Allow the cupcakes cool for 10 minutes on their own pan. 17. While they are still warm, use a very sharp knife or bread knife and slice the tops of the cupcakes off. You can eat the tops later on…. they should taste great! 18. Make sure that you don’t have a stuck cupcake, so run a soft spatula around each one to make sure they will unmold easily. 19. Plan a large baking tray over the cupcake pan. And quickly invert over. Then, one by one and super carefully transfer them to a cooling rack. Allow them to cool for about 1 hour. 20. Once the cupcakes are room temperature, we are going to add the grownup part: in a small coffeecup dish put the Curacao. Carefully take each cupcake and press on the liquor until is fully incorporated to the cupcake base (it will look blue!…easy) and put them back on the cooling rack. 21. Now, we are going to add the final touch: in a small sauce pan mix the 1/4 cup of rum and the final 1/4 cup of brown sugar. Using low heat do a syrup. Pour the rummy syrup on top of each cupcake. If you ran short, then just do a bit more syrup. The idea is that we want moist cupcakes (moist on the bottom and moist on top). Autumn gives me this feeling of home, the warmth of the fireplace and the smell of spices. Outside is raining and I realize that even though the current wife is home today, after almost 30 years of unparalleled happiness she is doing her thing and I am doing mine. Happiness I tell you. Just last week after the mysterious case of the disappearing Chocolate Madeleines, at the moment still unsolved (I baked 2 dozen and the day after they just disappeared and the only one around is the wife who denies even touching them), I decided to finally use my pumpkin shaped blunt cake mold that I got on sale at William Sonoma last year. You can not say that I'm not patient! I do like spices, I do like some Fall flavors BUT I do not like pumpkin flavor. You will never see in this website any recipe that calls for the flat taste of pumpkin (pumpkin cheese cake....NO!). My reasoning of this dislike I place it in the heritage of the foods and flavor tastes of when I was a kid. I am fully convinced that one likes what one had as a child, as if the taste buds develop when you are growing up. So, here is the recipe. You can use any blunt cake mold, but if you have the one I used...then the wow factor reaches the roof. 1. Position a rack in the lower third of an oven and preheat to 325°F. Generously grease and flour the wells of the great pumpkin cake pan, if you have one, otherwise any blunt cake pan will do; tap out excess flour. 2. To make the cake, in a medium bowl, sift together the flour, baking powder, baking soda, salt, cinnamon, ginger, nutmeg, allspice and cloves; set aside. 3. In the bowl of your electric mixer fitted with the flat beater, beat the butter on medium speed until creamy and smooth, 1 to 2 minutes. Add the brown and granulated sugars and beat until light and fluffy, about 5 minutes…NOT LESS THAN THAT! , stopping the mixer occasionally to scrape down the sides of the bowl. Add the eggs one at a time, beating well after each addition. 4. Reduce the speed to low and add the flour mixture in three additions, alternating with the piloncillo or molasses syrup and beginning and ending with the milk, then the flour. Beat each addition until just incorporated, stopping the mixer occasionally to scrape down the sides of the bowl. 6. Divide the batter between the wells of the prepared pan and spread it evenly. Tap vigorously the pan against the kitchen counter to eliminate air bubbles. 7. Bake until a toothpick inserted near the center of a cake half comes out clean, about 1 hour and 15 minutes. Mine takes a bit longer… about 15 minutes longer. 8. Transfer the pan to a wire rack and let the cake halves cool upright in the pan for 15-30 minutes. 9. Gently tap the pan on a work surface to loosen the cake halves. Carefully invert the pan onto the rack and lift off the pan. Let the cake halves cool completely before decorating, about 2 hours. 10. Meanwhile, make the frosting: In the bowl of an electric mixer fitted with the flat beater, beat the cream cheese on medium speed until smooth, 2 to 3 minutes. Add the butter and beat until combined, 1 to 2 minutes. Add the confectioners sugar and vanilla and beat until fluffy, 2 to 3 minutes. 11. Using a bread knife, cut 1/4 inch off the flat side of each cake half, or enough so the two flat sides can coincide. Place one cake half, (if you have the pumpkin mold the bottom part of the pumpkin) flat side up, on a cake stand or plate and spread the pumpkin frosting on top. Place the other cake half, flat side down, on top. 12. 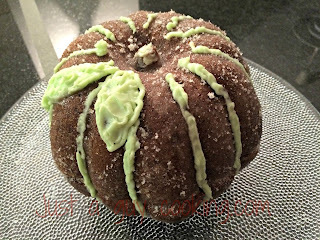 Add food coloring as desired to the reserved frosting (green for leaves and tendrils). To create leaves and tendrils, using a rubber spatula, transfer the green frosting to a pastry bag fitted with a leaf or medium plain tip. Pipe leaves and tendrils on the top of the cake. 13. I melted a bit of butter, painted the cake with the melted butter and sprinkled the cake with a mix of sugar/cinnamon. That is optional though! This is the thing: since I was little little and young young (I was once both: little and young) that woman that claimed to be my mother had, between many many idiosyncrasies, this "I must drink a coffee first thing in the morning", so every day before anything -including saying good morning- she went to the kitchen and put the tea pot on the stove while she prepared her coffee. Way back then, at least in Mexico where we were living at the time, the only imaginable coffee one could possible drink was either Instant Nescafé or Instant Café Oro- and...if by any chance someone had gone to the USA, then they were asked to bring Maxwell House....wooooow. The advertising was "great ideas come from great coffee" and somehow I think she bought into that even though the great ideas never came to her (buying boxing gloves for Christmas so my bully brother could beat me in a professional way is not exactly a great idea nor having me play a little cute Mexican native for a mother's day school play in grade one in a public school...I WAS BLOND and WHITE!! !....I was beaten by the school's older kids as if I was a Conquistador in the middle of an Aztec battle). Regardless...the ideas did not come with the coffee... I can attest to that. I learned about this coffee grinder thanks to Bea's baking book -one of my all time favorites- and I ordered it on line. It was not expensive (around $25 US back then) and I got it quite soon after. 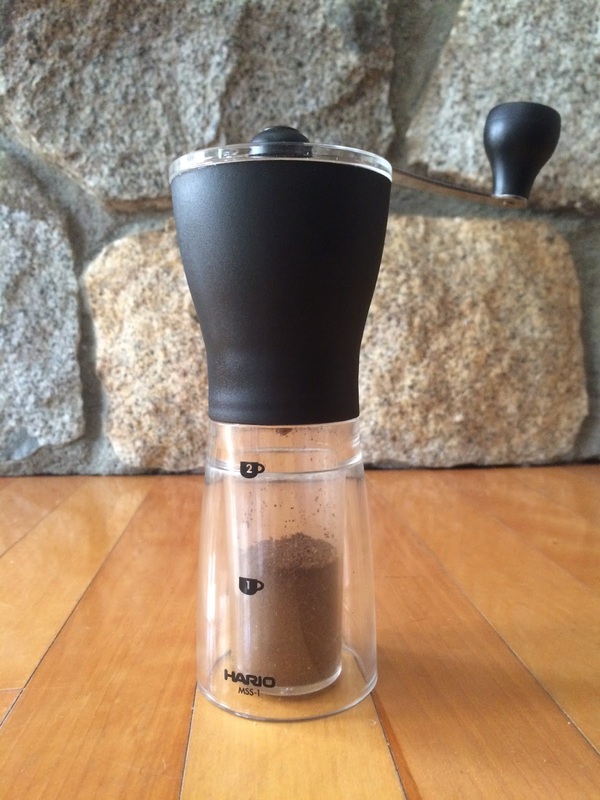 This is a FANTASTIC personal coffee grinder. It can grind for 1, 2 or 3 servings. I am the only one who drinks coffee here, so I always grind just for me. This "personal" coffee grinder is made of high quality plastic and it doesn't wake up the cats when I prepare my coffee. The noise level is minimal. This is a ceramic burr grinder that can be adjustable (by adjusting a locking nut on the base of the burr) so I can grind for a filter (my Italian French Press has a metal filter so no waste there), for an expresso machine like my ROK or whatever other setting you might need. The burr set is of great quality and the end result grind is as even as it can get. Grinding your fresh coffee just prior to drinking your joe releases all the aromas and oils that makes the coffee drinking experience a taste of heaven. For traveling is a great alternative as it uses almost no space AND its as silent as it can be. I highly recommend this grinder, unless you rather drink tea...because that I have absolutely no idea how to prepare. Oh, and by the way....for those who claim that coffee is bad and addictive I can debate that in a second. I have been drinking coffee for almost 50 years (I am SO old!) and still here and if I look like a zombie escapee is not exactly for drinking coffee... marriage is worst for your health, for example. I drink coffee and I'm married. I am a masochist.